Are angels aliens? Maybe the question that should come before this one, is what and / or who are “angels”? Spiritual beings or some similar idea has usually been the answer meant to satisfy inquiry into this question. In the early 21st century with the advancements in technology, in our understanding of the nature of reality as well as a few revolutionary finds and conclusions in the world of archaeology, answers like this no longer satisfy. When it comes to the descriptions of angels and of other seemingly “supernatural” or inexplicable phenomena in scripture / religious texts / ancient texts, could we possibly be looking at descriptions formulated by a technologically unadvanced society that does not have the terminology, knowledge or language to be able to adequately describe what it is witnessing? If we take the stories in the first five books of the Old Testament / Torah, many if not most of which are found in more ancient sources, notably the Sumerian tablets, where the “gods” according to some interpretations, come “from above” and are physical living breathing entities then the odds are good that the messengers of “God” or angels (the ancient Greek word from which we get the English word means messenger simply) in these stories are people from another planet like the “gods”. Am I saying that these stories in the books of the Pentateuch are true stories as we in the twenty first century understand that concept? No I wouldn’t say that. I’m not a literalist. I do think, however, that ancient stories generally have a grain of truth in them, that they point to a situation or event at the time of the original story. In addition to the Pentateuch we also have the rest of the books in the Torah, the New Testament as well as the Apocrypha and other deuterocanonical and non canonical writings, to examine for reference to angels. Angels have long standing popularity and seeming profusion in terms of variety in certain religious traditions, for example in the orthodox Christian ones like the Roman Catholic. Their appearances in scripture, however, are fairly few and far between but momentous when they do occur. Other sources for the tradition of angels in religious traditions is something worth exploring. In canonical scripture as we have it there are only two angels that are actually named, Michael and Gabriel, a pretty interesting point to consider since tradition includes far more angels than just these two. Tobit which is considered apocryphal does have Raphael as a main character and some scholars think that he is the angel that shows up in the gospel of John, though he is unnamed there as well. We do find references to these and other angels in apocryphal sources, like the book of Enoch for example. What is interesting when looking to scripture for reference to angels is the point that when they appear as men these beings in their interaction with humans are normally not described as having physical wings. When angels or angelic beings are described with wings involved the beings themselves are not usually otherwise described as men or as having a human form. This brings up the question of what exactly is being described, whether a physical being or more likely to my mind, a machine. Angels do often appear as men in scripture and are described as behaving like humans, having something to eat, sleeping etc. Some examples of this are the angels who appear to Abraham to announce the birth of Isaac and the angels who come to Sodom to warn Lot of the impending disaster there. The idea that angels are aliens, that they were part of an expedition of people from another planet to Earth, an expedition whose agenda might only be really understandable as we become a more technologically advanced society, is something that in order to be proved will have to take into account a wide array of ancient sources. 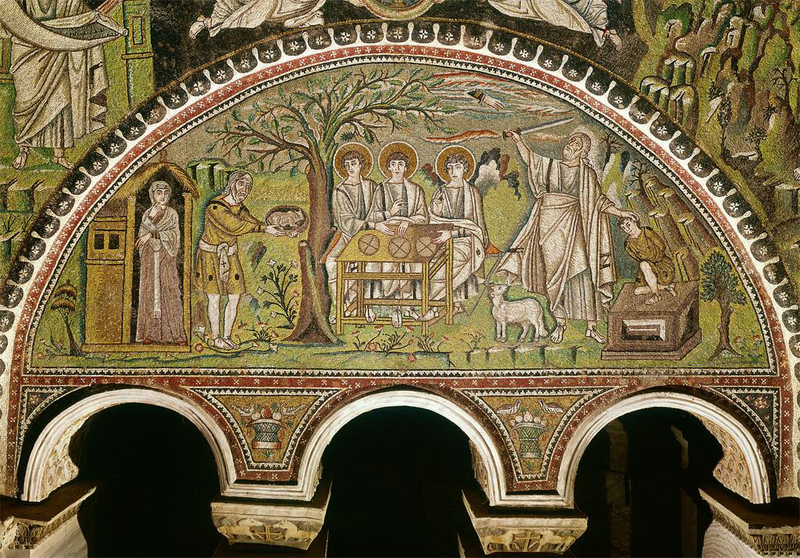 A sixth century mosaic from the north wall of the church of San Vitale in Ravenna, Italy showing two of the episodes in the story about Abraham. Three angels are depicted in the centre. Here is an article by Michael Salla exploring the idea that some of the stories involving angels and Nephilim etc in scripture and other books like the book of Enoch, are essentially stories about aliens and alien intervention in human civilization. This entry was posted in Angels and tagged aliens, angels, scripture. Bookmark the permalink.